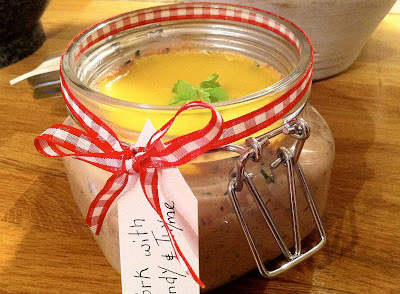 Making jars of your own pâté is great fun, and they make brilliant gifts, and even work as an instant bring-along starter to a dinner party. I've been experimenting recently with different flavours and textures, and have finally found the perfect combinations! This is one of my favourites - it's rich and creamy with a delicious herby aftertaste. Top tip: If you want your pâté to last (and to look really professional) make sure to seal it with clarified butter. 1. Dice the pork loin into pieces roughly 1cm by 1cm. Place in a bowl and pour over the brandy. Add the thyme and garlic (peeled and crushed). Mix well before covering and leave to marinade in the fridge, preferably over night. 2. Prepare the livers by cleaning them and removing any excess sinew. Place the livers in a bowl and pour over the milk, this takes away some of the bitterness. Leave to one side. 3. In a large non-stick frying pan, over a medium heat, melt 50g of butter. Add the marinated pork loin plus marinading juices to the pan and cook for 10 mins on a low heat or until the pork is cooked through. Remove from the pan with a slotted spoon and place in a food processor. 4. Take the livers out of the milk and place in the frying pan, sear the livers on a medium heat on all sides. The aim is to have cooked the outside but to still have a little pinkness in the middle. Add the cooked livers to the food processor with the juices from the pan, and ensure all thyme branches are removed and discarded. 5. Roughly chop the parsley and chives and add to the food processor with the cream. Mix all the ingredients in the food processor until almost smooth. Season with salt and pepper and mix for another minute. 6. Transfer the pâté to a Kilner jar (or other suitable receptacle) and top with clarified butter made from the remaining butter. Press a parsley leaf into the top of the butter for decoration. 7. Leave to chill in the fridge for at least 4 hours before serving. Serve with my Sage & Parmesan Bread Rolls. Why not also try my Chicken Liver & Wild Mushroom Pâté, or my Chicken Liver & Tarragon Pâté! I am now in the process of meeting as many food bloggers as I can and I found your site http://www.fleursfood.com recently and was pretty impressed. I've added your site to my Foodie Blogs list here: http://www.eatingbangkok.com/foodie-blogs/ and would also like to add you to my blogroll. I'll be sure to check your recipes out! I love thai food.